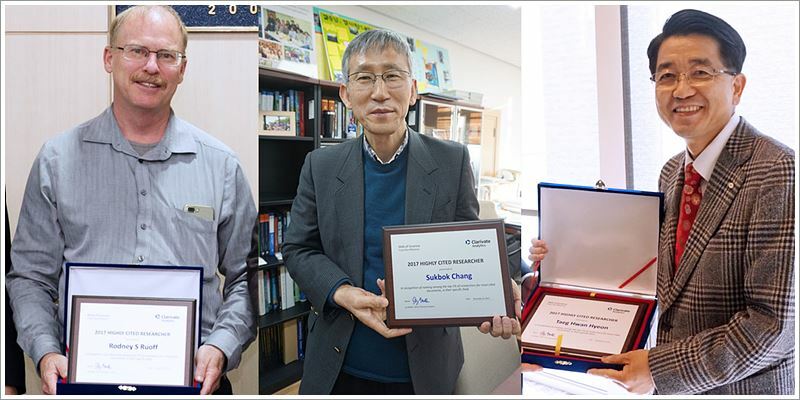 Director Rodney S. RUOFF, CHANG Sukbok, and HYEON Taeghwan of Institute for Basic Science (IBS) are listed in the top 1% of Highly Cited Researchers of The World in 2017 by Clarivate Analytics (formerly part of Thomson Reuters), a global academic information service firm. Director Rodney S. RUOFF of Center for Multidimensional Carbon Materials was ranked in the categories of materials science, physics, and chemistry for three years in a row from 2015 after his name first appeared on the list in materials science and chemistry in 2014. Among the only 20 researchers whose names were mentioned in three categories this year worldwide, he is the only one whose affiliation is a Korean institution. Director CHANG Sukbok of Center for Catalytic Hydrocarbon Functionalizations earned a spot in chemistry for three consecutive years since 2015 while Director HYEON Taeghwan of Center for Nanoparticle Research also was ranked in materials science and chemistry annually from 2014. Clarivate Analytics has announced the annual ranking of researchers in the top 1% by citations since 2014. This year’s list is the result of analyzing citations of over 130,000 papers published over an 11-year period from 2005 to 2015 in the Web of Science, an online subscription-based scientific citation indexing service. Over 3,300 researchers were named in 21 categories with the U.S. taking up the most spots with 1,661 researchers followed by 350 of the United Kingdom and 237 of China. Thirty scientists working in Korea were honored this year, 28 of which are Korean nationals.